BBC NEWS | Americas | Papers back Kerry - but does that help? Papers back Kerry - but does that help? John Kerry enjoys a lead in newspaper endorsements over George W Bush, winning over several newspapers that backed Mr Bush in 2000. And some newspapers that have been long-time champions of Republican candidates have decided to offer no endorsement, expressing disappointment with both candidates. However, there is little evidence that endorsements affect the race - and even editors and publishers believe they rarely sway an election. The readership and influence of newspapers have been in decline over the past two decades. According to Editor & Publisher magazine, the most recent tally shows John Kerry with 128 endorsements to George Bush's 105. 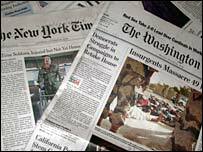 And 36 newspapers that endorsed President Bush in 2000 have instead given their nod to his challenger in this election. Mr Bush has won only four newspapers that backed Al Gore four years ago. 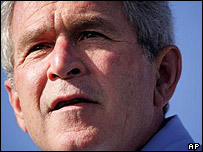 The Detroit News has never backed a Democrat but this year its editorial board felt it could not endorse Mr Bush either. The Tampa Tribune editorial board touted its conservative credentials while in a deeply pained column told of why it could not endorse President Bush for re-election. "As stewards of the Tribune's editorial voice, we find it unimaginable to not be lending our voice to the chorus of conservative-leaning newspapers endorsing the president's re-election," the Tribune wrote. But in its wide-ranging editorial, it criticised the president for overstating the evidence for invading Iraq and falling prey to neo-conservative groupthink. While the paper praised his business-friendly tax reforms, it criticised his failure to rein in government spending. The New Yorker magazine, for its part, has endorsed a candidate for the first time in 80 years, throwing its support behind John Kerry. In a five-page editorial, the magazine accused President Bush of "failure, arrogance, and - strikingly for a team that prided itself on crisp professionalism - incompetence." 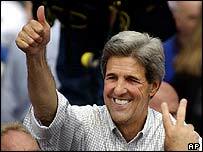 "In every crucial area of concern to Americans (the economy, health care, the environment, Social Security [pensions], the judiciary, national security, foreign policy, the war in Iraq, the fight against terrorism), Kerry offers a clear, corrective alternative to Bush's curious blend of smugness, radicalism, and demagoguery," The New Yorker editors wrote. Not all the news is bad for President Bush. The president has won over some newspapers that backed Al Gore in 2000, including the Denver Post. "President Bush has laboured erratically since his 2001 inauguration, and his first-term performance seems to have cheered and angered Coloradans in equal numbers," the Post's editors wrote. "But decisiveness is a crucial characteristic in the showdown with the nation's elusive enemies. We believe he meets the test, and we aren't sure about John Kerry," they added. And in the key swing state of Ohio, the Columbus Dispatch has endorsed the president. It's not surprising. The last Democrat the newspaper endorsed was Woodrow Wilson in 1916. This kind of endorsement in a key battleground might make a difference, said Herb Klein, a former vice president and editor-in-chief of Copley Newspapers and now a national fellow for the American Enterprise Institute. In a piece for the National Review, he interviewed editors of newspapers small and large and found that they believe that they have little influence on an election. But he says that in tightly contested states such as Ohio, Wisconsin, Minnesota, Iowa, Pennsylvania and Florida, endorsements might be enough to sway undecided voters. However, Mr Klein said that the influence of newspaper endorsements has been declining over the last 20 years because people get their news from a wider variety of sources and tend to have weaker party affiliation than in the past. Tim Porter, a former assistant managing editor of the San Francisco Examiner, thinks the influence is not only weakened but almost nonexistent. "Generally for president, it's almost meaningless," he said. He quoted a 2000 Annenberg Public Policy Centre study that found the impact on national races too insignificant to measure. But in local elections and primaries, newspaper endorsements might have some impact. Unlike in presidential elections - where some voters argue they suffer from being overwhelmed with news coverage - in local elections, there is often a lack of information so voters rely on newspaper endorsements. And many reporters say that John Edwards was propelled to a stronger-than-expected second-place finish in the Iowa caucuses in January by an unexpected nod from the Des Moines Register. Newspapers continue to offer their endorsements because they feel it is important to reflect their editorial philosophy, Mr Klein said. But Mr Porter believes that in a time where readers are looking for any hint of bias, that endorsements might have outlasted their usefulness. He said that readers increasingly do not understand the separation between the editorial board and a newspaper's reporting staff. Several newspapers have had to run columns explaining the wall between editorial staff and reporters. "If they have to explain it, it's not working," he said.